Another major new feature coming with the ICH6-R is “Matrix RAID”. Instead of being limited to the physical limits of performance of a single hard drive, a PC with a RAID 0 array can read and write data in parallel from multiple drives. RAID 0 can therefore improve storage performance and can optimize data transfer, particularly useful when working with digital media. Another popular configuration is RAID 1, which provides added protection from hard drive failures by mirroring all data among two or more drives. While RAID 1 capability doesn’t provide the same level of performance as RAID 0, it adds value by helping to keep the system functional in the event of a hard drive failure. Until now it was only possible to combine RAID 0 and RAID 1 when using 4 hard disks. Intel Matrix RAID Technology combines for the first time the benefits of RAID 0 performance and RAID 1 protection on 2 hard drives. For example, video editing benefits from improved performance by using RAID 0, while personal photos and financial records can be better protected from a drive failure using RAID 1. The ICH6 also features an AHCI (Advanced Host Controller Interface). This interface enables advanced Serial ATA features such as Native Command Queuing and hot plug. Native Command Queuing, when paired with capable hard disk drives, increases storage performance on random workloads by allowing the drive to internally optimize the order of commands. Native Command Queuing is not possible with the older ICH5. 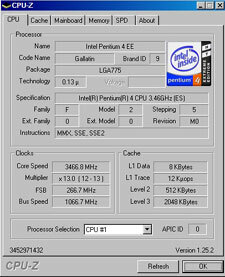 The new 3.46 GHz Extreme Edition processor is based, as are all other models of this series, on the “Gallatin” core. 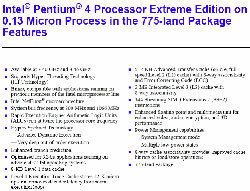 Intel launched the Extreme Edition in September 2003 as response to AMD’s A64. Its main feature is a huge L3 (level 3) cache of 2 MB in addition to the normal 512 KB L2. Intel’s main desktop processor line, the newer Prescott core based 500 series, comes with 1 MB of L2 cache, but no L3. With the release of the 3.40 GHz EE Intel moved the EE series to the LGA 775 socket so that this processor can run on 9x5 chipset based motherboards. All Extreme Editions are based on the “old” 0.13 micron technology, they support Intel’s Hyperthreading technology, but do not support 64-bit extensions (EM64T). So, what makes the 3.46 GHz EE different from other EE processors? It’s the 1066 MHz system bus. The 3.46 GHz EE is currently the only Intel desktop processor running with a quad pumped system bus of 4x266 MHz; all other Intel desktop processors are running with a system bus of 4 x 200 MHz = 800 MHz. The 3.46 GHz EE is consequently clocked at 14 x 266 MHz. The 3.46 GHz EE operates with 1.53 to 1.6 volt and is dissipating 110.7 Watt. This is lower than the 115 Watt of a similar clocked Pentium 550 (3.40 GHz / 1.4 volt) based on the Prescott core, but still quite a lot in comparison to Intel’s Northwood core. In short: The 3.46 GHz EE is nothing else than the previous 3.40 GHz EE, but clocked at 13 x 266 MHz instead of 17 x 200 MHz. No other feature has been added or changed. Since Intel increased the processor clock speed above 3 GHz with their 3.06 GHz “B” in October 2002, Intel heatsinks have had a copper core to handle the increased heat load. 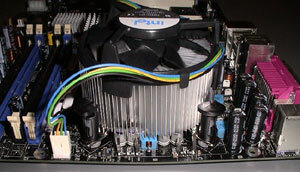 With the move to the LGA socket in July 2004 another redesign became necessary. 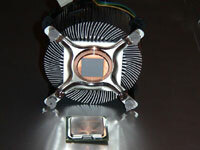 The stock cooler for the 3.46 GHz EE is the same that accompanies the Prescott core based 500 processor series. 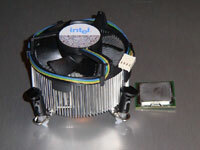 The heatsink fan operates with variable speed. It comes with a 4-pin connecter. The fourth wire receives a PWM signal (pulse width modulation) if the motherboard has a PWM fan speed controller and remote thermal diode measurement as our tested Intel D295XE has. In that case the fan speed is actually regulated by the processor’s internal temperature. If the fan connects only to a 3-pin header, the fan speed is regulated less efficiently by the internal ambient chassis temperature through a thermistor located on the fan inlet. The sink’s installation is easy. 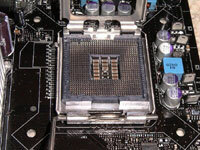 You push it into the 4 mounting holes around the LGA socket and lock it into place by turning the 4 heads. 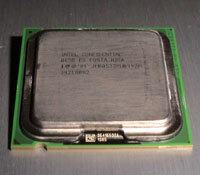 The LGA (land grid array) socket used for Intel’s Pentium 4 500 processors and the 3.40 GHz and 3.46 GHz Extreme Edition processors offers better electrical connectivity and regulation as well as better thermal conditions than a PGA (pin grid array) socket. 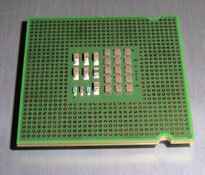 When the LGA 775 socket was demonstrated for the first time at exhibitions in 2003, it was speculated that new socket would be fragile and motherboards at risk by bending the socket embedded pins. During several weeks of testing and many reinstallations of our three test CPUs we did not meet any such problem. It goes without saying that a CPU should be installed with great care, but we don’t see any difference in damage risk between a PGA and a LGA socket. What happens in the worst case? The pins of a PGA CPU might bend or break - that would ruin in our case a 1000 US$ CPU. 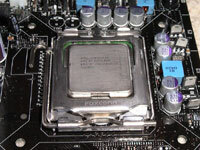 A LGA CPU has no pins; they are embedded in the socket itself. The CPU has “lands” instead that cannot be damaged like pins. Breaking or bending the board embedded pins is rendering a 200$ motherboard useless. Guess which situation is preferable?